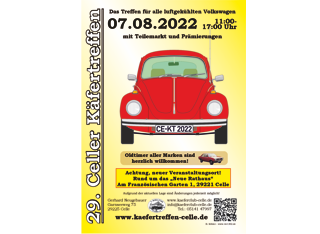 The Celler Beetle Meeting, this year already taking place for the twenty-seventh time, has become the second largest one day event of this kind in northern Germany. Many of our participants are loyal to us since the first meeting in 1991 and come every year with pleasure anew to present their motorized pieces of jewellery as well as, to answer interesting questions. To a beetle meeting not only belongs the perfectly round Volkswagen, but also his aircooled relatives. As there for example the practical VW buses and transporters, the pretty Karmann-Ghia and VW Porsche as well as the almost forgotten models VW 1500/1600 and VW 411/412. Of course you can see all kinds of variations of the good old beetle - whether the original pretzel beetle with divided rear window and just 24.5 HP in the rear, or the "Wolf in the sheep fur" with "Porsche-Engine" and more than 150 HP. As you can see, we try to offerto you a time trip through the more than sixty-year lasting history of a unique car. But we do not only coddle your eyes and ears - nobody has to starve or even die of thirst! We offer barbecue, cake and drinks to our guests. 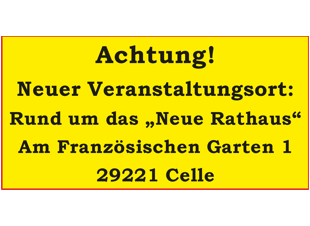 At the big Spare-Parts-Market along the "Bargain-Avenue" you can find a long desired piece or a souvenir for your home. And our small guests won´t be bored neither - a special children entertainment is prepared as well. Visit the homepage of the 1. Käfer Club Celle e.V.